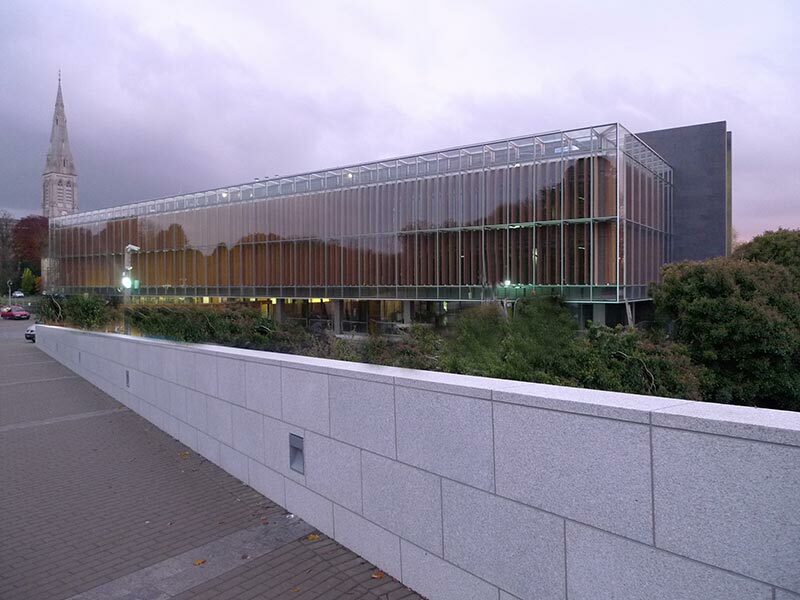 Our Client wanted to create a library building which has good natural daylighting, natural ventilation and has good acoustic dampning to the outside. The two latter items usually work against one another. To solve this unique problem J.V. Tierney & Co. (JVT) built a building model on the Integrated Environmental Solutions (IES) software platform. The key to achieving our goals was the design of a fully active twin skin façade. 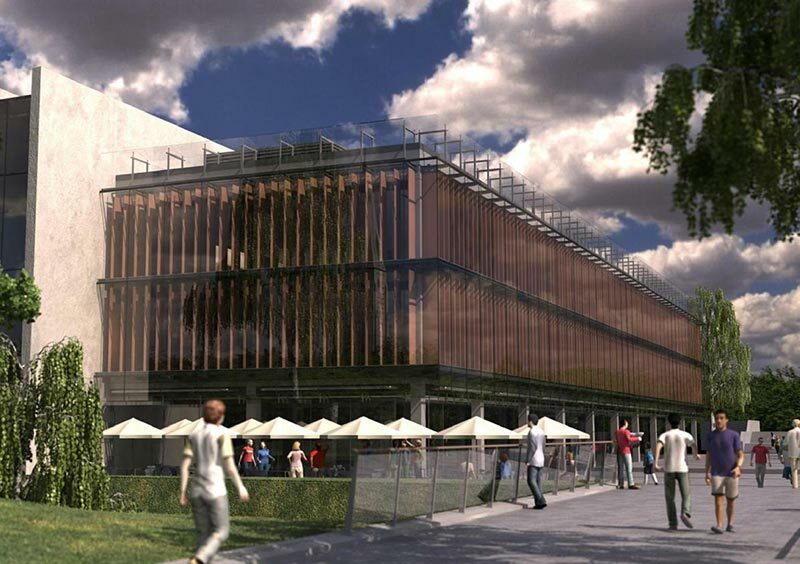 The façade would allow for the introduction of air and also act as an acoustic blanket to the main Kilcock Road and student thoroughfare outside. Twinned with our façade we developed a natural ventilation strategy which allowed incoming air to be pre-heated or locked out as required over the year. With these options came the challenge of increased capital expenditure. To overcome the capital expenditure we needed to show a payback to our Client. IES was used to show how the active façade, twinned with our natural ventilation strategy could minimise heat gain, maximise heat retention (when required) while also controlling overheating and maximising natural lighting, thus significantly reducing the energy running cost of the building. In addition the exposed concrete soffits and coffers allow for night cooling. All the systems are monitored and controlled via the Façade Management System (FMS) and the Building Energy Management System (BEMS). Each option used was inputted into our IES model and the benefits were extracted. control of the blind position is key to maximising the daylight into the library space thus reducing the requirement for artificial light while minimising internal glare. During winter time, we wanted to use the sun’s radiation to provide additional heat for the library. Hence solar levels take priority in this instance. In this way, valuable heating energy is saved. Where the external brightness exceeds a certain lux value, the blinds can partially close to provide some anti-glare measures but still leave the space bright enough that no additional lighting is required and the sun radiation provides additional heat for the room. During summer time we wanted to produce as much shade as possible for the Library,preventing nearly all direct sun energy from entering the Library space but at the sametime, leaving the room as bright as possible. To achieve this, the blinds can be slightly or fully closed depending on the brightness condition that exists on the façade at the time. It is important that there is the ability to control each double skin façade independently as the sun position/ brightness will not be equally bright on all sides. 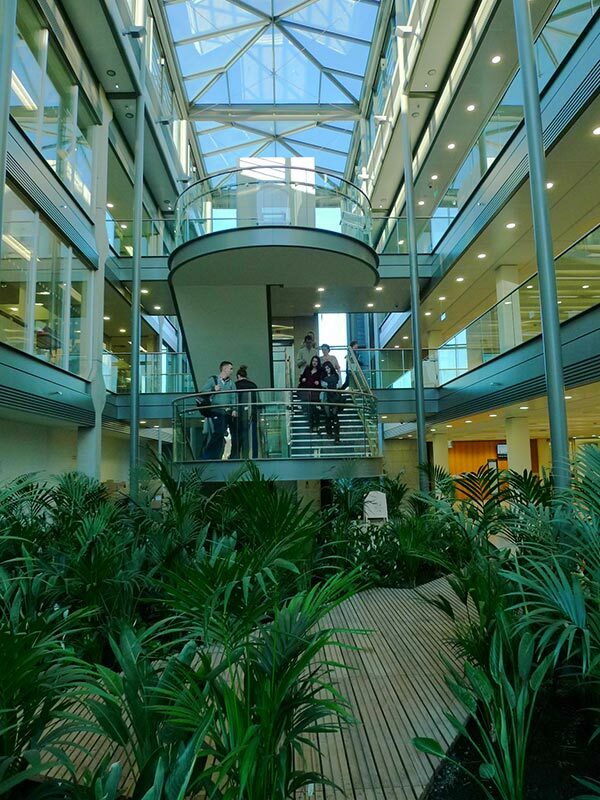 In all cases, the internal lighting levels are controlled via the fully addressable lighting management system with absence, presence and daylight detectors throughout. J.V. Tieney & Co. have spent the past 12 months monitoring the usage patterns in the building to confirm the accuracy of our IES model.